Before outlining my predictions for November 8th, let me first offer this disclaimer: I am no statistician, do not consult computer algorithms, and have no experience as a pollster. I am happy to leave all of that to professionals like Nate Silver. However, my experience as an author of American history, biographer of two American presidents (who between them, ran ten times for national office from 1920 to 1972), and as someone who has closely followed every election cycle since Dwight D. Eisenhower was reelected over Adlai E. Stevenson in 1956, gives me enough standing as a close observer to hazard a guess of how this campaign will turn. 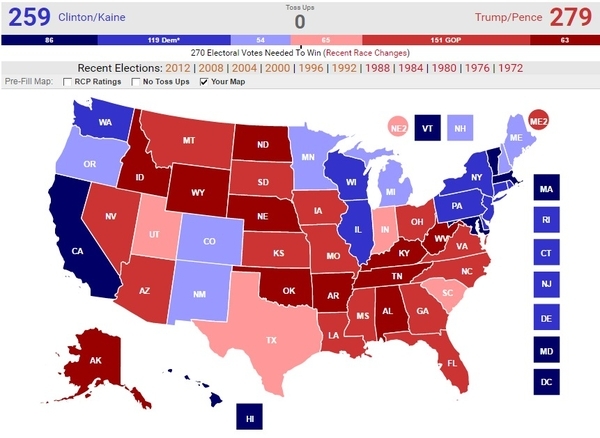 RealClearPolitics has the electoral map drawn up with 225 electoral votes for Clinton, 154 for Trump, and 159 up for grabs. I think all of the following so-called toss-up states will vote Trump: Ohio, Florida, Iowa, North Carolina, Georgia, and Missouri. I see Wisconsin, Pennsylvania, and Virginia as the real battlegrounds. With that said, I have never thought that Trump would take Wisconsin and Pennsylvania, but he is gaining steadily in those states and has a chance. I am unconvinced that Tim Kaine will be able to deliver his home state to the Dems, and am predicting a Trump victory in Virginia. Assuming Trump carries Nevada, and Maine's second district, neither of which he needs to win, the result will be a 279-259 Trump victory. If current trends continue, some other Clinton-leaning states, such as Colorado and Michigan, could crumble. The talking heads can't seriously keep on babbling this bunk that a candidate has never won from this far back. Trump is breathing down Clinton's neck like a dragon, and to paraphrase Harry S Truman and the Clinton campaign's own response to her abrupt departure from the 9/11 memorial, "if you can't stand feeling overheated, get out of the kitchen." Mrs. Clinton's reference to Trump supporters, which now constitute approximately half the American electorate, as "deplorables" and her Irish goodbye from the 9/11 memorial earlier today are not indications of tactical or physical stamina as we crank up to the final run to the wire.